Two lots of shipwrecked Gruaud Larose caught buyers attention at Sotheby’s auction last week but bidding for the top lots did not set the sale alight. 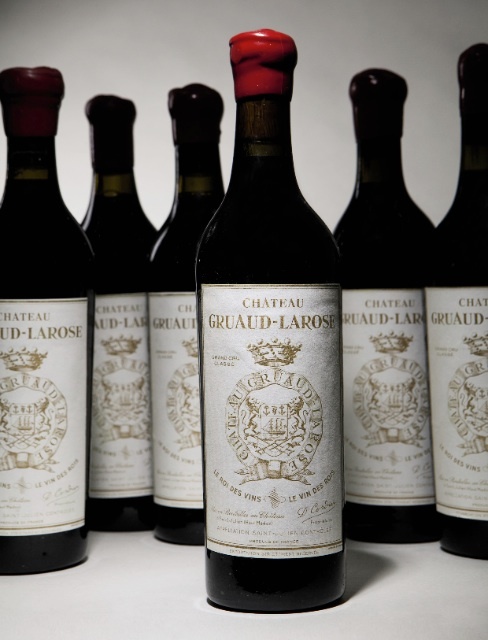 The two six bottle lots of the salvaged Bordeaux (pictured) both doubled their high estimates and sold for £5,405 apiece. The bottles were salvaged from the wreck of the Marie-Thérèse off the coast of the Philippines in 1991 and are believed to be from either the 1865 or 1869 vintage. Once brought to the surface they were re-corked and labelled at the château. Also performing well were a collection of 19th century Yquem, a bottle of the 1865 also doubled its estimate to £6,815, another bottle of the 1870 made £7,050 and a bottle of the 1894 made £4,230. Elsewhere though the top lots, comprised, as usual, of Domaine de la Romanée-Conti, Haut-Brion, Pétrus, Henri Jayer and Le Pin, sold within their estimates – all save a 12 bottle case of 1994 Echézeaux Henri Jayer, Georges Jayer propriétaire, which made £22,325 with a high asking price of £18,500. A collection of Ornellaia demi-magnums with designs by Michelangelo Pistoletto failed to even meet its low estimate of £7,500, the hammer coming down on £5,875. Rather better performers were the two lots of 1961 Haut-Brion, the first of nine bottles making £10,810 and the second full case making £13,513. However, once again, these prices were not above the high estimates. The sale was bolstered considerably by a sale of old vintage Champagne from Moët & Chandon on day one. In total the sale made £1.3 million and was 73% sold by lot. Stephen Mould, Sotheby’s European head of wine, said: “We were delighted with the total result of the Moët & Chandon Grand Vintage Collection which realised £147,333. The older vintages surpassed our expectations with prices soaring over the high estimates, and there was fierce bidding in the room and on the telephone for vintages from 1914, 1921 and 1928.